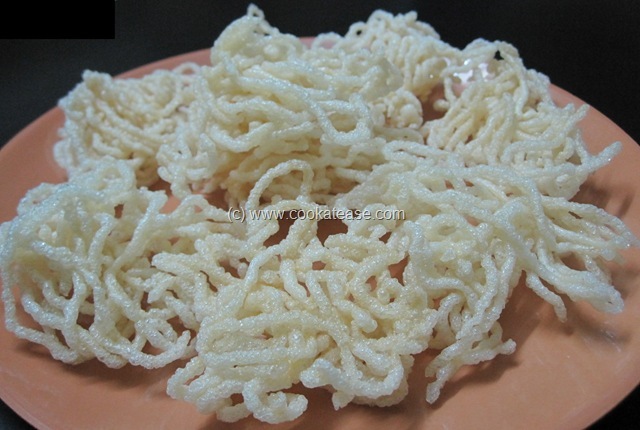 Here is Idiyappa, Ribbon, Kuzhal Vathal/Vadam using rice. Summer is the best season to prepare this vathal/vadam as it has to be sun dried. 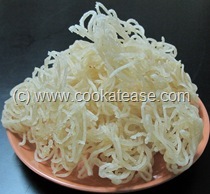 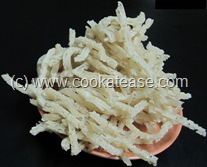 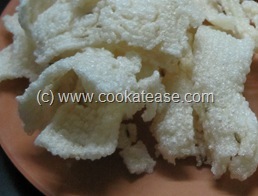 In addition mould that is used to prepare Idiyappam (String Hoppers) is necessary. 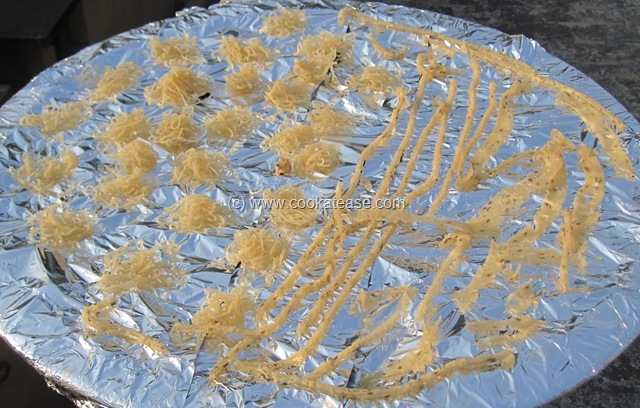 Also plastic (thick polythene) sheets or clean white cloth is necessary to sun dry the vathal. For a change, I tried using aluminum foil (but is not 100% suitable as it peels off with vathal in some places after drying). 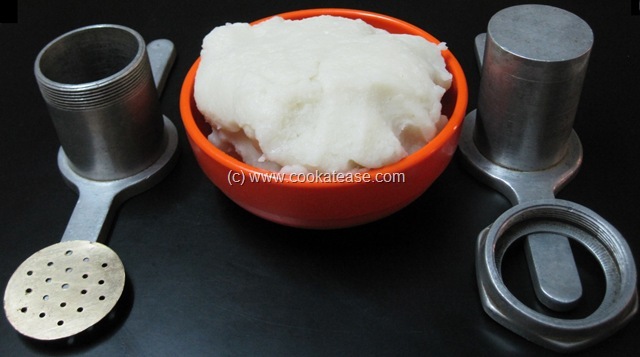 How to prepare the dough is available at Dough for Koozh Vadam/Arisi Vathal (Indian Rice Fryums). Here is the dough and the mould that I used to make this vadam. 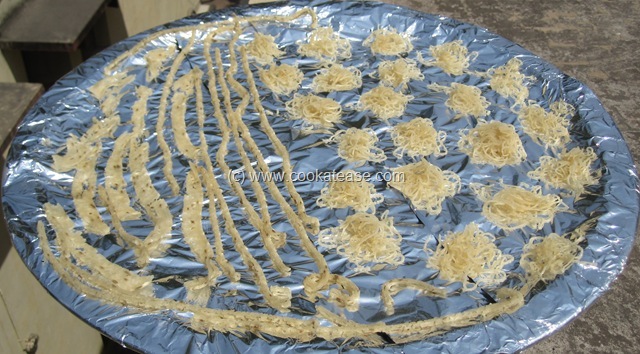 In the same basic dough add some cumin seeds and knead; here is the mould that I used to make this vadam. 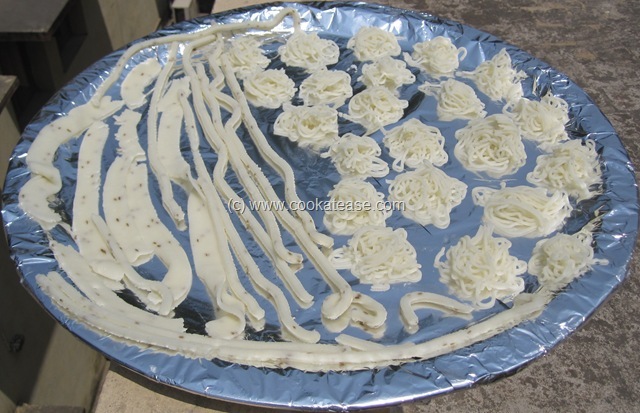 Fill the mould with some dough (use wet hand to take the dough) and press it on a plastic sheet/clean white cloth/aluminum foil as we do for string hoppers or Idiyappam; dry it in the direct sun light for 2 to 3 days. 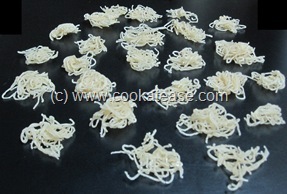 Here are day 1 morning and evening photographs. 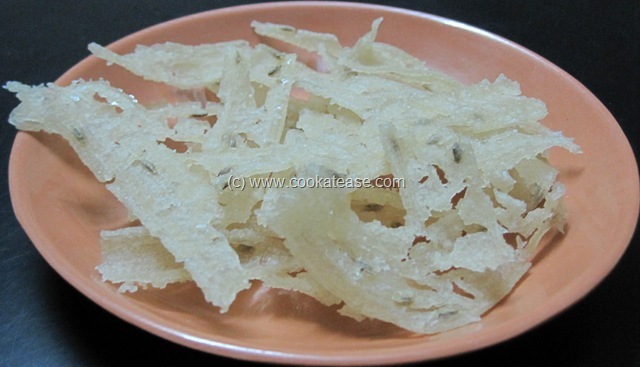 Dry it again on the second day (if it can be peeled, peel of the vadams, change the side and dry); for me it took only 2 days to fully dry it; here is day 2 evening photograph. Here are fully dried and peeled vadams as on the second day evening (Idiyappa vathals in photographs). 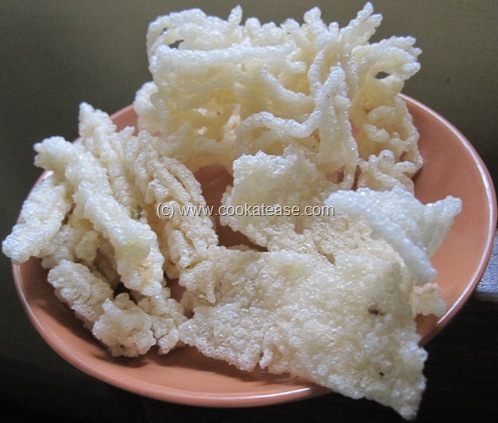 Here are fully dried and peeled vadams as on the second day evening (Ribbon and Kuzhal vathal in photographs). From third day onwards, you can fry and use the vadams. 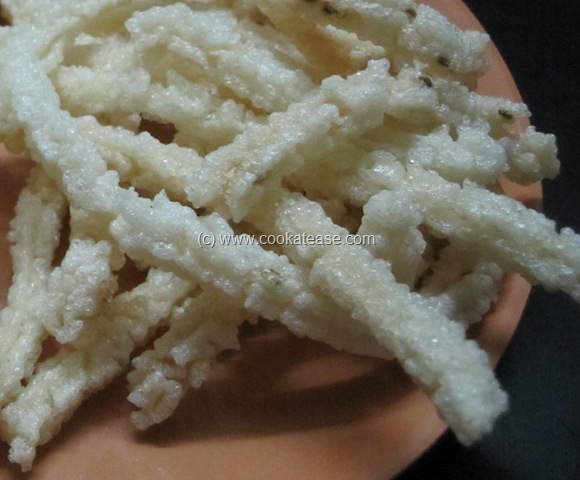 Here are the fried crispy Idiyappa Vathal. 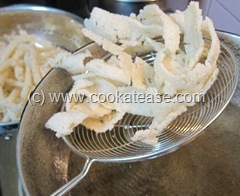 Here are the fried crispy Ribbon Vadam. Here are the fried crispy Kuzhal Vadam. Here are all the three vadams. 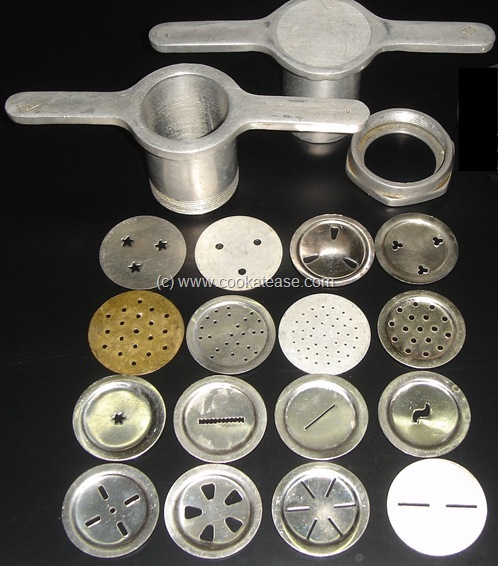 Here is the mould with different designs to make vathal. 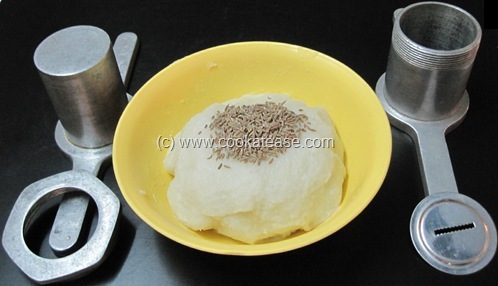 Cumin seeds are not to be mixed in the dough for Idiyappa vadam as the holes will be blocked while using the mould. In villages they use palm leaf mats to dry these fryums but in cities plastic sheets or cloth is used. 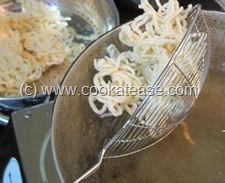 Lovely, thanks for the step by step presentation. 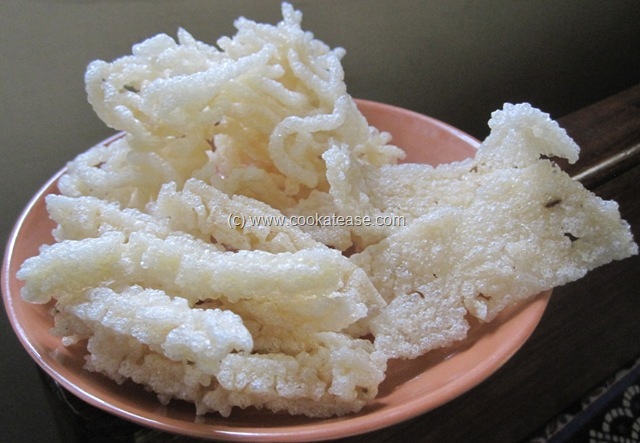 You are just amazing, everyday there is atleast 2 posts from you and most of them are authentic south indian dishes. way to go..
going to try this out for sure……….